Apply Ceramic Coating white color for first coat! Tint final top color. For Gray color - Use approx 1 oz of black tint for one five-gallon pail. Be sure to measure how much tint is added and then use this same amount on additional pails. There is a point in which the coating will not achieve any darker appearance and you are just wasting tint. If tinting, it is best to pour tint into premixed pail. Using a hopper (such as a 55 gallon drum or plastic container of 20 gallons) will make for a more uniform color. Pour tinted container into hopper until approximately 3 five-gallon pails worth of material are in hopper. Agitate hopper with paddle. This will blend the color to give an even shade of gray. It is also easier to spray out of this hopper system than if mixing and spraying out of five gallon pails. 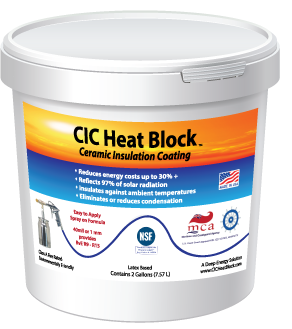 Instructions for Application of all three products, CIC Boost, CIC Heat Block and CIC Rhinoskin. Adhesion and drying of the acrylic latex coating requires a minimum surface and ambient temperature of 50° Fahrenheit (10° Centigrade). To fully cure and harden a minimum ambient temperature of 60° Fahrenheit (16° Centigrade) is required over the course of 72 hours. Individual application coats may dry and be ready to recoat within 1-3 hours, subject to ambient temperature and humidity conditions. Apply via spray gun at wet film thicknesses of 12 or 24 mils (.012” or 0.024”/ approx. .25mm or .5mm) that will dry to 10 or 20 mils (0.010” or 0.020” / approx. 0.25mm or 0.5mm). Surface coverage per gallon is about 50 square feet or just under 10 square meters at 0.020”/20 mils or 0.5mm dry film thickness. The coating should mix to a “marshmallow mousse” or “loose pudding” consistency within 30-45 seconds at a medium stir speed. 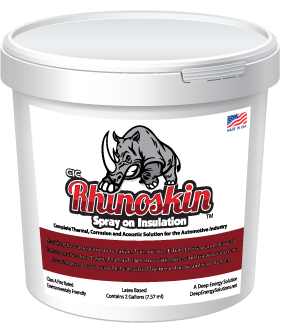 The coating is formulated for high solids content to maximize coverage and performance using airless spray equipment. For use with the small siphon sprayer, mix with 2 oz. of water per quart or 68 ml to a liter. Hold the pail on the floor, securing it with your feet. Use the type of stir paddle shown at right. Use the reverse setting of a 1/2" (12mm) size drill motor or air driven motor. Other types of paddles may be used. However, this type is the most suitable. Key is using a slow speed setting and in reverse. This helps prevent scraping of plastic shards from the inside of the pail and their clogging the spray gun. With an air-driven mixing motor, it is possible to "crimp" the air line with your hand to slow the motor speed down. Push the stir paddle down into the pail. Then push up and down to the top and bottom of pail without turning on the motor yet. Then slowly turn the motor in reverse and scrape off the sidewalls at the same time. When all the material is loosened off the sides, a slightly higher (medium) speed can be used for mixing contents. After 30-45 seconds of medium speed stirring the contents should resemble a pudding or tapioca or marshmallow mousse consistency suitable for spraying. If the coating is still too thick to spray, add 1/2 a cup (0.10 liters) of water, at most, to the 5 gallon container and mix again. On material that has been in the pail for up to a year, up to 1/2 liter may be added to loosen the coating and mix into a smooth consistency. If coating is overly stiff due to cold conditions, use no more than 4-8 ounces of water per pail to loosen up the coating consistency. The small application sprayer may need 2 ounces of water per quart. Make sure your airless sprayer has fresh seals. Ceramic particles are hard on seals and accelerate wear on already worn seals. If you have used your sprayer with solvent-based systems, we recommend a fresh seal kit prior to use of our product. Use leather seals if possible. Be sure to purge airless sprayer with 15-20 gallons of water and circulate prior to placing pickup nozzle into product. Pull the orifice nozzle out of gun or remove gun to bleed any trash or unwanted items and cover intake tube with a mesh to prevent intake. Prime sprayer with product by removing spray nozzle orifice to insure that all trash is removed from system. This is especially important if sprayer is used often and lines are not new. In confined spaces, use ventilation fans to help evaporate moisture when spraying the coating as humidity will increase as the coating dries. This rise in humidity will lengthen the dry time. Air movement will greatly reduce drying time. In hot, extremely dry climates (very low humidity conditions), lighter coats of 12 mils WFT (DFT 0.25mm) may be appropriate versus 24 mils WFT (0.5mm DFT) if you notice the top layer of the coating drying first and preventing the lower layers from evacuating moisture and drying properly. In colder climates, spray a light 5-10 mil (0.25mm) coat initially and let it tack dry. This will help to deter sliding of product due to excessive thickness initially. This will also expedite dry times. Spray more light coats as opposed to one heavy one in colder or in extremely dry climates. Work smart and think out strategy prior to spraying. Spray areas that are hard to reach prior to bulk of application. Use ladders and scaffolding if needed. If product is found in undesired space or area, clean immediately via water and scrubbing method. If product slides or blobs occur, smooth out with brush or let dry thoroughly prior to sanding smooth removal via wire wheel or scraping. If spraying more than one coat, tinting can be used to differentiate coats. Standard acrylic tint can be used and is found at most paint supply houses. A good method is to use a hopper system (see Hopper system). Mix one ounce of black tint (will tint the coating gray) per five-gallon pail. Pour the tint into the bucket after the coating has been mixed. Stir the tint into the coating briefly. Periodically mix the hopper with the paddle. By using this method, a consistent color will emerge. DO NOT TINT THE FIRST COAT! It is important to keep the first coat white, as it will help differentiate the substrate and the insulating coating. Surface temperature must be at least 50°F (10°C) for adhesion and at least 60°F (13°C) for resin to catalyze and fully cure over a total of 72 hours. On surfaces below 50F, coating will slide off vertical or overhead surfaces. Coating will withstand light rain exposure after about 8-10 hours if thoroughly dried. Surface has to be 100% clean, free of dust or oil residue and dry. Remove filters from pump and spray gun. Stir in reverse setting slow to medium speed for less than 2min. Do not thin. Warm pails first. If necessary, 5-8 oz of water per pail only. Use airless pump 30:1 or greater. 3,000 psi. Use a hose diameter of at least 3/8” and use 0.5” for longer lengths to ensure pressure is maintained. Short “whips” (3’) only. “Trigger” between application “strokes” to maintain pressure. Overlap “strokes” to achieve 12 to 24 mils WFT. Remember you’re building insulation layers, not 3 to 5 mils of paint. Apply a thin “tack coat” first – 12 mils. Maintain a distance of about 18” from surface when applying. Use a wet mil gauge to verify application thickness during application and then a dry film gauge to verify thickness when dry before applying new layers. If ambient temperature is below 60°F/15°C consider using warm water tubs to warm pails. Use fans, heaters or dehumidification equipment within interior spaces to accelerate drying time and applications. On boats, coat stiffeners first and then the flat panels. On hot surfaces (200F to 250F), apply 5 mils and then 10 mil coats. In very dry conditions, apply 12 mils WFT layers to prevent surface skimming and to prevent trapping water in the coating. Apply no more than 40 mils under ambient conditions and no more than 80 mils on hot in-service applications per day. Wash sprayer and tools with water. Ceramic Coating has good adhesion qualities with typical pull strength of 280-320 psi. Clean, dry and stable surfaces are the first priority for ensuring strong adhesion. If there are any doubts about the surface to be coated due to primer age or surface condition, contact Advanced Coating Solutions. Water-jet, wheel abrade or blast surfaces (SP1) to remove loose scale on ferrous steel surfaces and apply a suitable primer system. On new stainless, aluminum or galvanized surfaces a scrubbing using a 50/50 mix of vinegar and water or a citric-based degreaser to clean. On oxidized aluminum, abrade with scotch brite pads or use a suitable primer. When applying over epoxy-coated surfaces or coatings with hard to adhere to surfaces, abrasion is also recommended. Deep Energy Solutions recommends using a primer system that will be capable of 20% higher temperature than the surface’s peak temperature will incur. Consult our primer reference sheet if more assistance is needed. Apply primer system on all areas of the steel including welds and touch up areas. Follow primer directions for surface preparation. Wait 24 hours to make sure primer is cured. 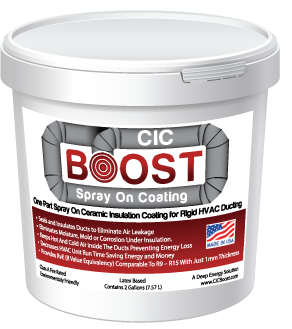 Ceramic Insulation Coating can be sprayed directly on top of clean, dry primer without any other prep. If there is a long delay between primer application and Ceramic Insulation Coating application, make sure surfaces are clean and free of foreign matter by wiping surfaces down with a rag or air sweep. On ferrous steel applications, a primer will obviously extend service life of any coating system. The same applies to Ceramic Coating applications and is recommended. Because ceramic coating is a water-based system, application on non-primed surfaces at ambient temperatures can result in flash rusting on initial layer(s). Once those layers are dry, the flash rust is confined. Due to the thicknesses commonly applied, ceramic coating will provide significant anti-corrosion protection to surfaces if applied properly. Ceramic coating has been applied to practically all types of primer systems and found to be compatible. Key is allowing for proper cure time for primers. Application on zinc-based primers: Apply a initial coat of water-diluted ceramic coating at 5 mils WFT (0.125mm) first to cause the zinc to outgas, forming small bubbles under the ceramic coating before dissipating as you let this wet coat dry out over the course of 24 hours. After 24 hours, proceed with coating as normal. Call or email for information on primers and topcoats. On new galvanized, stainless, and aluminum metal, use a light vinegar wash (1:1 water:vinegar) before applying Ceramic Insulation Coating. This clears oil residue and/or protective materials or welding residues off surfaces. On older galvanized, stainless, or aluminum metal that’s dirty or any surfaces exposed to oily films, etc., apply a water-based citric degreaser, scrub, rinse thoroughly with water to remove any detergent residue and ensure surface is dry prior to coating application. To provide surface profile (“tooth”), a light sanding can improve adhesion. 180-220 grit sandpaper is recommended on older aluminum or surfaces if adhesion is in question. A good primer system is recommended on steel to ensure longest lifespan of equipment and to prevent flash rusting if the first coat is applied on bare steel. If a primer is not used, some level of flash rust should be expected. Typically, the flash rust will be contained within the first layer only and will be covered by additional layers. For hot service applications, choose a primer that will withstand temperatures 20% higher than the stated service as Ceramic Coating will maintain higher and sustained heat levels against the surface. A hopper system can be an effective tool when spraying large amounts of the coating. Larger containers of varying sizes that fit your spray pump are perfect for mixing and containing the product. The best system is to mix each pail and then pour into the hopper. This works well when multiple guns are being used and consistent flow of product exceeds mix rate. Place the pickup nozzle for the sprayer at one end of the container and periodically stir the hopper with the mud paddle. This system will allow the sprayer to have consistent product throughout the application. When used with a lid, the hopper will help prevent drying of the top layer of coating and sidewalls of the hopper. With top coating it is vital to check to insure the topcoat is compatible for the type of application. Topcoats may affect performance of insulation qualities if they are denser and more heat conductive. The normal procedure is to add an additional coat of the coating prior to using a topcoat. Make sure that Ceramic Coating has cured for 36-48 hours prior to any topcoat. This will insure that the coating has fully dried and will not affect any topcoat. Shorter wait times may be appropriate depending on the timing and thicknesses of the initial application. If the ceramic coating was applied systemically in 12 mil wet film thicknesses and allowed to thoroughly dry, then a 24 hour wait period may be OK. Since Ceramic Coating has a slight porous profile, no other prep is needed. The topcoat can be sprayed directly onto Ceramic Coating. The substrate needs to be free of dirt, dust and grime prior to application. This can be accomplished by a light air sweep. For harsh conditions, ACS Ceramic Coating can be top coated. In non-caustic or low acidic environments an Acrylic topcoat can be used over Ceramic Coating. This system is similar in physical characteristics as Ceramic Coating and if used properly, should give lasting results. In caustic environments, Ceramic Coating has been top coated with other coating such as epoxies, urethanes, and zinc based products. To date, we have not found any compatibility problems. Ceramic Coating can be applied on surfaces up to 350F (177C) while equipment is in service. Key to this method is applying multiple thin coats with a 5-10 mil (0.125-0.25mm) initial coat and layering of additional coats at approximately 0.25mm (10 mils) WFT thickness. You shouldn’t apply over 80 mils DFT (2mm) per day under these conditions to ensure coating can dry thoroughly. This coating is a non-Hazmat product. For safety, wear glasses, gloves and use a dust mask to avoid breathing coating. Proper OSHA approved respirators and goggles are recommended for your protection when using this product. Use only with adequate ventilation. When applying in closed area, open doors and windows or use other means to ensure fresh air circulation or forced ventilation during application and drying. If you experience eye watering, headaches, or dizziness, increase fresh air or wear respiratory equipment. If exposed to eyes: Flush eyes with clean water. Skin contact: Wash with soap and water. If redness persists, seek medical attention.